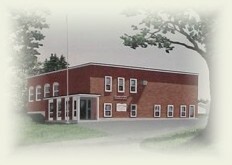 The Northern Registry of Deeds Building was originally located in St. David, Maine. In 1846, the St. David building burned and a new Registry of Deeds building was built on the corner of Elm and Hall Street in Fort Kent, Maine. In 1965 the building was enlarged by approximately twice its original size. The main entrance of the building was relocated from the north side to the west side of the building. This in turn changed the building address from Elm Street to Hall Street. As a result of the 1965 expansion, the Registry of Deeds was located on the upper floor and the Maine District Court housed the ground floor. Up until the mid 1970's the Bureau of Civil Emergency Preparedness (CEP) occupied offices in the basement. After the St. John River Dike was built (1976), there was a decreased need for CEP services in the area. The CEP officially moved out of the Registry Building in 1986. In 1987 the Maine District Court vacated the building for handi-capped access reasons. In the same year, the University of Maine Co-operative Extension Service moved into the ground floor, which they renovated by partitioning off the large courtroom area into several smaller offices. In 1996, the Registry Building underwent major renovations to meet building guidelines set forth in the Americans with Disabilities Act of 1990. The renovations consisted of the removal of a one-story entryway, which was replaced by a two-story entryway for the purpose of housing an elevator. Many of the doorways were widened and several of the hallways were redesigned. The driveway was also relandscaped in order to provide proper egress from the parking lot to the main entrance of the building. In 2013 the University of Maine Co-operative Extension Service relocated and the ground floor was renovated to expand space for the Registry of Deeds. A County conference room was constructed as well as offices for facilities management and the Sheriff's Office. In 2015 a Community Corrections office was established on the first floor of this building.